UCLA Medical Center, Santa Monica nursing staff celebrates Magnet recognition. UCLA Medical Center, Santa Monica is proud to have received the nursing profession’s highest honor: the American Nurses Credentialing Center’s (ANCC) Magnet® Recognition. 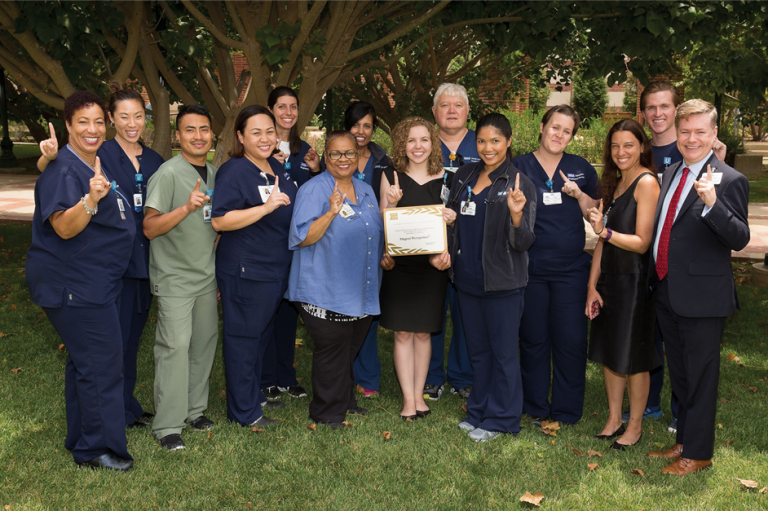 “This achievement validates that UCLA Medical Center, Santa Monica delivers excellent patient care and is a great place to work,” says Leah Korkis, nursing practice outcomes and Magnet coordinator at UCLA Medical Center, Santa Monica. Over the last five years, the nursing staff has implemented a series of practice improvements in preparation for Magnet consideration. “A cultural transformation took place at all levels,” says K. David Bailey, interim chief nursing officer at UCLA Medical Center, Santa Monica. In the fall of 2015, a group of nurse leaders and clinical nurses submitted an extensive application detailing examples of excellence. “One highlighted the I See You Baby program started by our neonatal intensive care unit,” says Bailey. Following acceptance of the application, a team of Magnet appraisers spent three days at the hospital, assessing the quality of nursing leadership, as well as coordination and collaboration across specialties. The ANCC also looked at quantitative factors such as patient fall rates, infection rates and the number of nursing staff with advanced degrees and specialty certifications. In June, UCLA Medical Center, Santa Monica received Magnet recognition, a distinction fewer than 8 percent of U.S. hospitals achieve. “Magnet designation means we exceeded the national average on the ‘Big 3’: patient outcomes, patient satisfaction and registered nurse satisfaction,” says Tina Morrison, a clinical nurse at UCLA Medical Center, Santa Monica.